Every so often a movie comes out that strips itself down to the core of reality and comes out with a beautifully entertaining glimpse into the lives of America's youth. 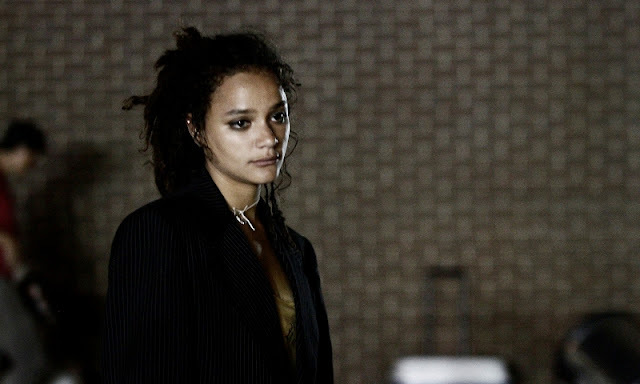 Andrea Arnold took a very unique approach to putting this story together which included populating the film with normal, every day people and having them all live out the story in a very realistic way. A typical door to door magazine sales crew travels around the country staying in cheap hotels and living out of pocket so that is what the cast and crew actually did while making the movie. These guerrilla style tactics prove to be very effective in creating the raw realism that comes across so clearly on screen and leaves you feeling emotionally drawn in and thoroughly engaged with the characters and story. Cinematographer Robbie Ryan, who has worked with Arnold before, manages to find some truly exquisite moments by utilizing an immersive style that fills the screen with an abundance of textures and colors while maintaining a very unique cinematic quality. As I mentioned before, the majority of the cast is filled with real people who had absolutely no acting experience prior to joining and were chosen because they perfectly fit in with the rest of the crew. Taking this approach might seem like a huge risk, but Arnold is able to draw some beautifully natural performances from her cast and ends up with a powerful ensemble that will be hard to match. I was even impressed with Shia LaBeouf's performance in this film and that is really saying something considering I have really not enjoyed much of anything he has done up to this point. Seriously though, this could be a real turning point for his career and could lead him down the type of successfully artistic path everyone had originally predicted for him when he first broke into the Hollywood scene. Okay, so we have to talk about Sasha Lane for a moment. This young woman was literally found on a beach by the director, was asked to audition for the lead role in this film, and she absolutely knocked it out of the park. She is such a shining light in this film and her mere presence just brings joy and hope to every moment she is on screen. I can definitely see why Arnold was so taken by this extremely and unexpectedly talented woman as her creative energy, stunning beauty, and killer attitude are all tailor made for a film like this. If she wants it, Lane could dominate the film industry for years although, after hearing her speak at a recent Q&A, I get the feeling that she will aspire to contribute something much more than a simple acting career during her time on this planet. Her energy and enthusiasm for life gives you the feeling that she will be amazing at whatever she decides to do and she absolutely represents the free spirit of a generation forced to grow into a world that doesn't make any sense and all of this, of course, is why she was so perfect for this film. American Honey is an achievement in film making for so many reasons. Andrea Arnold has created a shining example for why independent films are so important to the culture of cinema and the movie going experience. There are no big special effects, no blinding star power, and no fancy Hollywood style ending. This film is pure magic. It is a film you have to see. It will leave you breathless and wondering why you can't stop thinking about it.